Do you remember a time when you were so immersed in a project at work that you were alert, 100% present, stimulated and just “in the zone”? Everything was jiving together and time flew by. You were totally satisfied and confident in your abilities. This state is called “flow” and we typically first experience it as children when we are playing. If play is so paramount to our being and helps us be the best possible versions of ourselves, why should we “grow up”? Fortunately, many companies subscribe to the belief that play is paramount and embrace it as part of their culture. Axosoft is one. Yeah, these things are needed in the workplace! Which is one of the reasons Axosoft takes time to work out, play video games and yes, indulge in Nerf gun battles. Nerf wars break out in a moment’s notice and as an employee here, you have to be at the ready. Because if you’re not, you’re just a sitting target with a bullseye on your back. And trust me, you don’t want that. So, here’s my review of eight Nerf guns that I personally have either used or have seen used successfully. Because, at the end of the day, we take no prisoners, make clean code, deliver software on time and have fun doing it. Four words: Thirty miles per hour. Unlike most of the other guns at Axosoft, this piece of heavenly craftsmanship shoots out little yellow foam balls, instead of the normal boring long ‘darts’, at the unheard of speed of 30 miles an hour! Sadly the clip only holds 12 balls, so I’m constantly having to refill, which can also be a pain because the little round buggers like to roll. During most of the fire fights you’ll see me hunched over in panic as I scurry after my roll-away ammo. Good if you’re planning to stay in one spot. The best thing about this gun is the dart bullets are the size of a small Buick and pretty much feel about the same when you get hit by one. However, because of the ‘mega’ size, you’re basically stuck in one spot while you snipe at any poor soul who mistakenly runs by your hiding spot. Impressive, but tends to jam. You’ve been warned. This was my first Axosoft gun, and while I loved the menacing low hum of warning it sent out when I pressed the lower trigger, I did NOT like the jamming. So. Much. Jamming! Plus the top cocking mechanism you have to use to move to the next canister of darts was awkward and usually caused me to spend most of the Nerf battles hiding behind a potted ficus trying to get the darn thing to work. Accurate, portable and and an easy favorite. This Nerf gun may be the most popular gun at Axosoft. 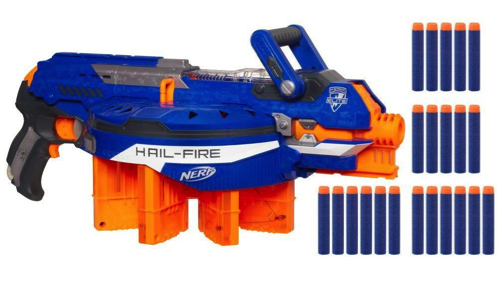 It makes a nice scary fighter helicopter engine noise when you press the trigger, it shoots out darts at an impressive speed with the best possible accuracy you can get from a Nerf dart gun, and it has a handy dandy face shield clipped to the front. But to be honest no one really uses the shield, as they prefer to shoot this Nerf gun from their hip, all Rambo style. This coveted machine keeps you safe. There are a select lucky few that have the vortex stashed under their desk and they guard it closely as it shoots out discs rapidly and painfully. It has a large cartridge that holds about 40 discs, which means while others are frantically trying to reload, the vortex users are calmly walking around the office destroying all they find. Never has ‘size doesn’t matter’ been more true than it is when it comes to this little sneaky bugger. When war is declared, and you’re on defense as you weave and dodge through the office, you’re only focused on finding someone toting a big gun. But with the Triad, some despicable human being can walk up to you with their hands in their pocket and then BAM right between the eyes… I hate those guys. Welcome to Axosoft. Here’s your starter Nerf gun. Both of these guns are usually mercy guns given to the employees that are not as devoted to the Nerf battles as the rest of us. Most the time during a battle you can find them under the desk trying to figure out how to make their gun shoot or screaming “DAMMIT GUYS, I’M NOT PLAYING!!! !” which is ignored by their fellow co-workers as they’re annihilated with balls, darts, discs, and mini Buicks. So, there you have it. Do you think you have what it takes to win a Nerf gun fight or develop software? If so, check out our open positions; there may be a spot for you. And remember, always watch your back.